The International Solar Innovations Council organized its second major event in Finland, in Helsinki and Espoo during 15-18 October, 2018. The Helsinki-Espoo event, participated by approximately 150 people from 14 different countries, consisted of three separate seminars and two INSIC working meetings. 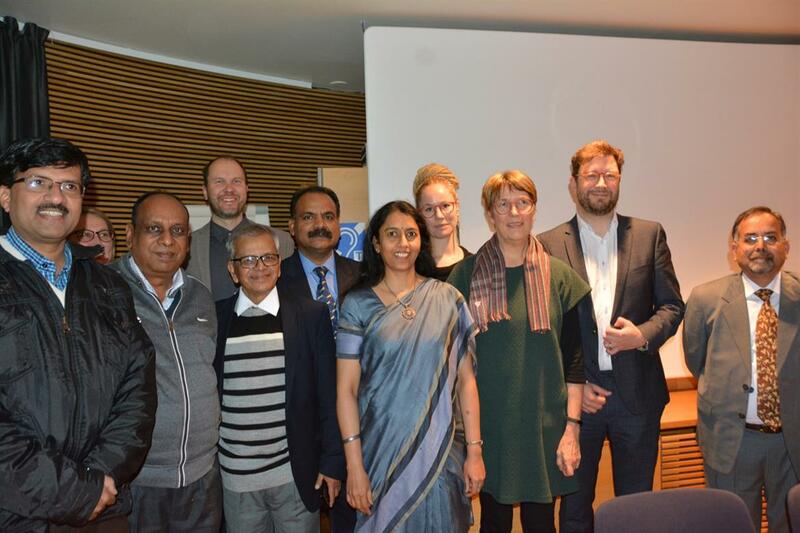 One of the seminars was organized together with Finnish development NGOs, at the FINGO (Kepa) headquarters. Another was a joint effort with the Aalto University Sustainability Hub in the Aalto University campus and the third took place in the Finnish parliament, in cooperation with Siemenpuu Foundation and the inter-party energy reform group and inter-party group for global affairs of the Finnish parliament. The thirty plus introductions in the seminars presented a wide spectrum of new ground-breaking innovations in solar energy and related fields. Some of them were high-tech and the others high-tech/low-tech hybrid innovations, geared to meet the needs of the world’s three billion poorest people. According to the Finnish organizers of the conference, the event highlighted India’s already prominent and rapidly growing role in the development of high-quality but affordable (solar) technologies geared to meet the needs of the world’s three or four billion less affluent people. The organizers had tried to find exciting examples of new solar innovations from different parts of the global South but found very little compared to what was happening to India. According to them it now seems, that India has largely taken the responsibility for developing the (solar) technologies and solutions that can raise the poorer half of the world’s population out from poverty. The Indian solar-powered water purifiers designed to cater for the needs of middle-sized schools have done extremely well trials. They were developed by professor Gonchaudhury, the chairman of INSIC, and his colleagues in NBIRT, together with their industrial partners in India. The first 100 units have now been installed and are providing clean drinking water for 50,000 school children. The incidence of water-borne disease among them has been reduced by 72 per cent and the girls’ school drop-out ratio has declined from 46 to 14 per cent. All this has been achieved with very little money because the system only costs about euro 600, or euro 800 with a solar-powered water pump. The material costs of equipping 100,000 schools and 30,000 other institutions in India with similar systems would only amount to euro 100 million, and a half a million similar solar-powered water purifiers for half a million schools in the global South could be purchased by 400 million. It now seems that the availability of clean water is a prerequisite for successful education for many kids, especially among the girls. All studies now agree that empowering and educating girls is crucially important for numerous different reasons, including population control. In Sub-Saharan Africa population growth has not declined as much as governments had hoped, and it is now feared that the region’s population might grow to five or even six billion before leveling. This scenario would be a human and ecological nightmare and everything that can be done to prevent it from becoming a reality should be done. Solar-powered water purifiers might, somewhat surprisingly, offer some assistance for these efforts. Dr Lal Singh of the Himalayan Research Group (HRG), another member of INSIC, and Dr Maninder Jeet Kaur have developed solar water heaters and solar space heaters that can be made locally and partly from locally produced materials. In spite of their high quality HRG’s solar water heater only costs euro 100 and the domestic space heater only euro 70, which makes them attractive even for most rural households living in areas where space heating is required during the cold seasons. Dr Singh’s and Dr Kaur’s designs constitute an almost order-of magnitude improvement when compared with Chinese solar collectors, which tend to cost almost ten times as much, not to say anything about the European and North American models, which are even more expensive. In the seminar Dr Singh emphasized the importance of five planning parameters. Succesful technologies must be socially acceptable, need-based, cost-effective, long-life and require the minimum amount of post-installation maintenance. Professor Gonchaudhury’s Surya Jyoti micro solar domes, the original starting point of the whole INSIC network, were also discussed in the seminars. In field trials the average reduction in a household’s carbon emissions, due to the installation of a single Surya Jyoti micro solar dome, has been 27 kilograms per month. The households that were using some kerosene and electricity to produce lighting have saved on average 10 euros per month, which means that a Surya Jyoti costing 25 euros has paid its purchase price back more than four times during one year. In the future the equation will become even better, because the price of the Surya Jyoti package is expected to drop to around 10 euros when the real mass production phase will be reached. According to the World Health Organization small particle emissions and other pollutants produced by the world’s 400 million traditional biomass cooking stoves cause approximately 4.3 million premature deaths, every year. Besides this, the traditional biomass cooking stoves are responsible for a significant percentage of global soot emissions, and other emissions with a direct or indirect global warming impact, like carbon monoxide, nitrous oxide, methane, ozone and free hydrogen. The particle emissions of biomass stoves could be reduced by roughly one hundred times if the traditional cooking stoves were replaced by advanced models equipped with small electric fans. For example ARTI in Pune, Maharashtra and Aprovecho in Oregon, USA have developed affordable, good-quality designs. However, their fans require 0.5 – 4 watts of electric power which is a problem for the poorest households that have no grid connection. The solar panels and batteries of the Surya Jyotis could perhaps solve this part of the problem. Also in the seminar organized together with the Aalto University Sustainability Hub a large number of exciting new technologies were introduced. While the price of lithium has sky-rocketed to euro 12,000 per ton, sodium is a waste matter that can be acquired with a negative cost. In other words, with sodium batteries there would be virtually unlimited scalability. Broadbit’s sodium batteries can be recharged in half an hour, which is a major benefit over lithium and lead. Moreover, they already have an energy density of 300 watt-hours per kilogram and might be able to raise to 400 wh/kg. The maximum currently achieved by lithium batteries is around 250 wh/kg, while 100 – 150 wh/kg is the more common standard. Mr Kimmo Tiilikainen, the Finnish minister for environment, energy and housing, mentioned that Finland’s installed solar power capacity has increased 10-fold in three years and that the global capacity is expected to increase by at least 440 gigawatts during the next five years. Ms Satu Hassi, a prominent member of the Finnish parliament, a former member of the European parliament, and the chairwoman of both the inter-party group for global affairs and the environmental committee of the Finnish parliament, emphasized that energy-saving programmes and technologies are even more important in the fight against global warming than renewable energy, which is also important. Professor Gonchaudhury mentioned, that the average price of solar power in India had, in 2017, already dropped to US 3.6 cents per kilowatt-hour.